"No Watery Glades . . . Connecticut River Valley"
In this view the photographer looks southerly down the Connecticut River Valley from the base of Chesterfield Mountain (now called Mount Wantastiquet) in Hinsdale, N.H., toward the town of Vernon, Vermont. A tree frames the view on the right and the river extends through the middle of the image. Two lines of a poem by Revolutionary War era poet and politician Joel Barlow are etched into the plate: "No watery glades through richer valley shine, nor drinks the sea a lovelier wave than thine." Plate is signed "T.M. Easterly Daguerrean." Easterly, Thomas M. (Thomas Martin), 1809-1882, “"No Watery Glades . 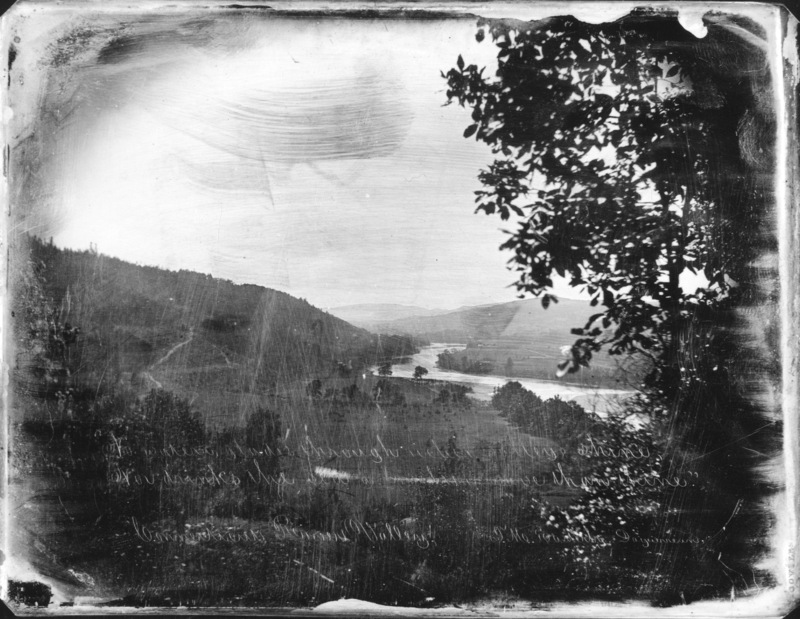 . . Connecticut River Valley",” Digital Vermont: A Project of the Vermont Historical Society, accessed April 18, 2019, http://digitalvermont.org/items/show/1102.